"This research has broad impact, because by deepening our understanding of cell reprogramming we have the potential to improve disease modeling and the generation of better sources of patient-specific specialized cells suitable for replacement therapy," said Plath. "This can ultimately benefit patients with new and better treatments for a wide range of diseases. Plath's team found that the changes that happen in cells during reprogramming occur in a sequential stage-by-stage manner, and that importantly, the stages were the same across all the different reprogramming systems and different cell types analyzed. "The exact stage of reprogramming of any cell can now be determined," said Pasque. 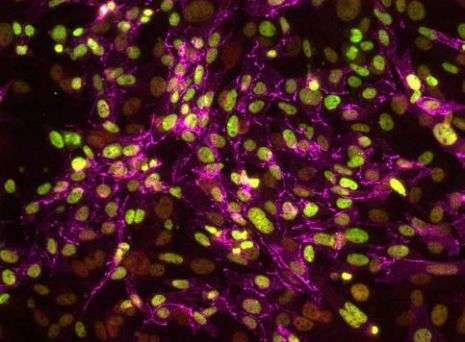 "This study signals a big change in thinking, because it provides simple and efficient tools for scientists to study stem cell creation in a stage-by-stage manner. Most studies to date ignore the stages of reprogramming, but we can now seek to better understand the entire process on both a macro and micro level." This microscope picture shows a colony of induced pluripotent stem cells (iPSC) obtained by reprogramming a specialized cell for two weeks. The starting specialized cells can only make more of themselves, while the reprogrammed cells obtained from them can give rise to all cells of the body. Plath's team further discovered that the stages of reprogramming to iPSC are different from what was expected. They found that it is not simply the reversed sequence of stages of embryo development. Some steps are reversed in the expected order; others do not actually happen in the exact reverse order and resist a change until late during reprogramming to iPSCs. 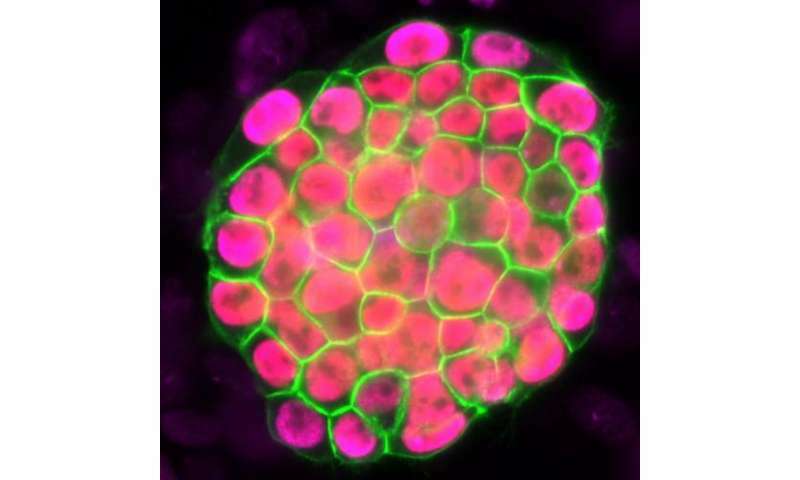 "This reflects how cells do not like to change from one specialized cell type to another and resist a change in cell identity," said Pasque. "Resistance to reprogramming also helps to explain why reprogramming takes place only in a very small proportion of the starting cells." With these findings, Plath's lab plans future studies to actively isolate specific cell types during specific stages of reprogramming. They also hope the research will encourage further investigation into the characteristics of iPSC development. More information: "X Chromosome Reactivation Dynamics Reveal Stages of Reprogramming to Pluripotency," Cell, Volume 159, Issue 7, 18 December 2014, Pages 1681-1697, ISSN 0092-8674, dx.doi.org/10.1016/j.cell.2014.11.040.